Did Earl Averill Have A Tremendous Walk-To-Strikeout Ratio? "As you have already seen, the only two Hall of Famers who hit home runs in their first at-bats — Averill and Wilhelm — were not famous for home runs. Averill did have three 30-homer seasons, but it was his all-around play, including a tremendous walk-to-strikeout [ratio] (774 walks to 518 Ks) and superior defense, that made him a terrific player." See A Homer His First Time Up! "That walk-to-strikeout ratio is perhaps not so tremendous. It is 1.496. But using the Lee Sinins Complete Baseball Encyclopedia, I found that the average player (non-pitchers) in Averill’s era had a ratio of 692 to 523, which is 1.32. That means that Averill was about 13% better than average since 1.496/1.32 = 1.13. Imagine that the average player hits 15 HRs in a full season. If you hit 13% more, you hit about 17. This is not tremendous." Baseball history often surprises us (well, it surprises me alot). 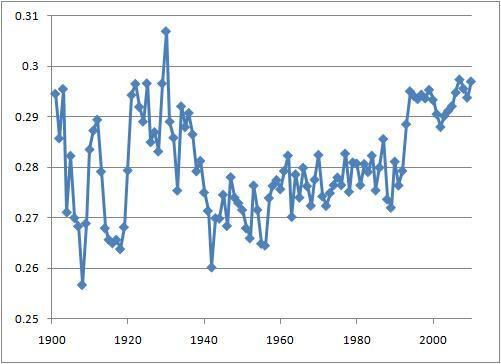 For example, I discovered that Fritz Maisel, in 1914, had perhaps the greatest base stealing season before Maury Wills in 1962 (taking steals, caught stealing, times reaching first base and the league average into account). I had never heard of him before. See What Were The Best Relative Base Stealing Seasons? There have been many times I started calling up lists of leaders in stats where I start to see names for the first time. So it is not surprising that we might see a guy like Averill and, not knowing the context, be impressed. Over the past five years in MLB, there have been 80,089 walks and 160,963 strikeouts. That means .5 walks for every HR. Averill's ratio was three times that. But there just were not that many strikeouts when he played. How did he compare to other players? 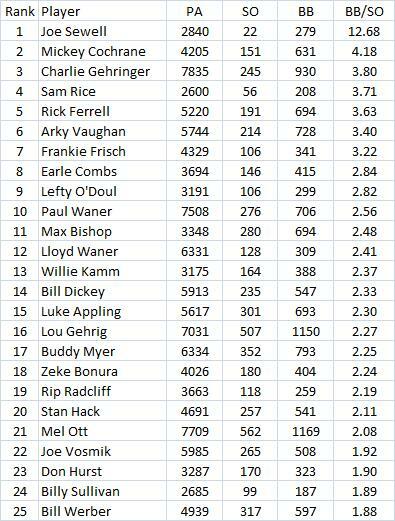 The table below shows the top 25 in walk-to-strikeout ratio from 1929-1940 with 2500+ PAs. Averill is not in the top 25. He was 60th out of 152 players. Yes, those numbers are correct for Sewell. One year his ratio was 16-1. Another year it was 17.75-1. 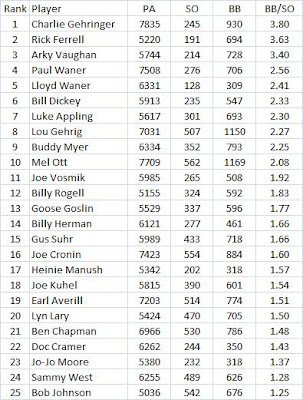 If I only look at guys with 5000+ PAs, Averill is in the top 25, as the table below shows. But, there were only 38 such players. Now he was a HR hitter, with 238 in his career. They sometimes strikeout alot. 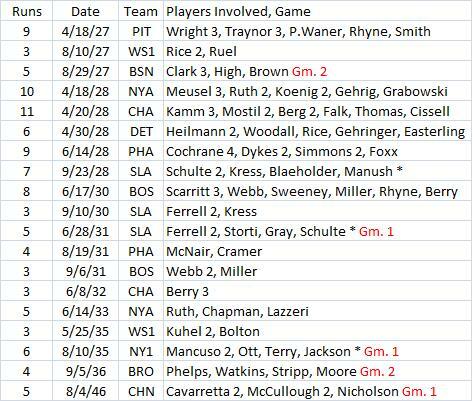 So I looked at all players from 1920-1950 who hit 200+ HRs. Here are the leaders. He is there, but there were only a total of 29 guys in the group. Finally, there were not many big strikeout pitchers in those days. The two lists below show the leaders in both leagues from 1929-40. That guy named Feller sure changed things. Averill did not face him much since he played most of his career for the Indians. I don't know how important this ratio is. Alot of young flame throwers see their strikeouts fall as they get older. Tim Kawakami of the Mercury News has a possible explanation. Go to The math on Tim Lincecum: Lots of pitches, lots of innings, not enough MPH (lately). 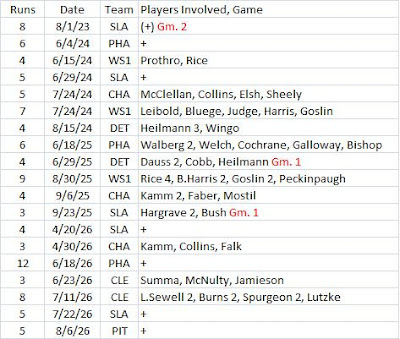 Prior to the SABR convention, someone pointed out to us that our box score of the second game of the June 1, 1930, double-header between the Giants and the Braves showed the visiting Giants scoring 16 runs without a single RBI. Our box score reflects the official version of the game. According to both our play-by-play account and numerous newspaper box scores, the Giants should have had 14 RBIs. I figured that there were probably several other games like this from 1920 to 1949. 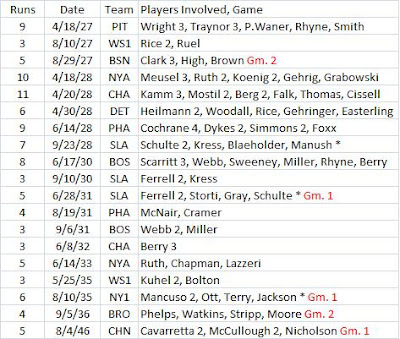 So I wrote a program to identify all the games where a team scored three runs or more without being credited with an RBI. My program found 71 games. Some of these games were not official errors. For example, on July 2, 1948, the Cubs scored five runs and all of these runs were scored as a result of a wild pitch, balk and errors. Here are the games I found that are (or might be) official errors along with the RBIs I think are missing. The number before the date is the number of runs scored by the team in the game. 1920 - George Sisler moves from a tie into 2nd place all by himself. Jacobson drops into 3rd place. 1922 - Tillie Walker's added RBI gives him an even 100 for the year. 1924 - Goose Goslin's league-leading total becomes 130. Harry Heilmann moves ahead of Hauser into 4th place with 117. 1926 - George Burns moves from a tie into 2nd place all by himself. Lazzeri drops into 3rd place. 1927 - Paul Waner's league-leading total becomes 132. 1928 - As mentioned above, Babe Ruth moves from a tie for the league leadership into first place with 144 RBIs. 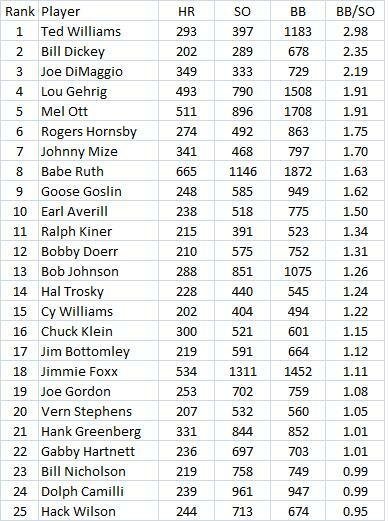 Lou Gehrig's total increases to 143 RBIs but he still drops into second place. Al Simmons and Harry Heilmann move into a fourth-place tie with Heinie Manush with 109 RBIs. All three have their totals increase, but Simmons and Heilmann's increase by two and Manush's only increases by one. I said "could" have the following effect because this is by no means the last word on RBIs for this period. I suspect there are several hundred remaining errors in the RBI data from this period and expect these numbers to continue to change as more research is done in this area. To highlight this last point, I thought it might be interesting to take a closer look at Gehrig and Ruth's RBI totals for 1928. Since this is the only proposed change that might affect a league leader, I went and looked at all of their games that season. Here's what I found. 4-18: Ruth +2 and Gehrig +1. Mentioned above - no RBIs credited to team. 5-10: Gehrig -1. It looks like his SH was put in the RBI column of the dailies. 5-26: Ruth +2. He was not given credit for his RBIs on a ground-out and sacrifice fly. 5-28: Ruth +1. He was not given credit for RBI on bases-loaded walk. 6-28: Gehrig +1 and Ruth -1. Ruth given RBI on Gehrig's sacrifice fly. 8-6: Gehrig +1. He was not given credit for RBI on force-out at second with the bases loaded. The attempt to double-up Gehrig resulted in a throw to an unoccupied base. Two runs scored on the play, but I think Gehrig should have given one RBI. 8-7: Gehrig +1 and Ruth -1. Ruth given credit for one of Gehrig's RBIs in the first inning. 9-9: Gehrig +1. Two errors here. First of all, two RBIs were put in the strikeout column of the dailies. And assuming that the intent was to give him two RBIs in the game, that means he was incorrectly credited with an RBI when he tripled and scored on an error. Either way, Gehrig was credited with no official RBIs and should have had one. 9-16: Gehrig +1. no RBI credited on solo home run. 9-18: newspaper box scores do not credit Gehrig with an RBI in the game, but I can not find a complete enough account of the scoring to make a case for a change. So what is the net effect of all these changes. Well, they result in 3 additional RBIs for Ruth and 5 for Gehrig. 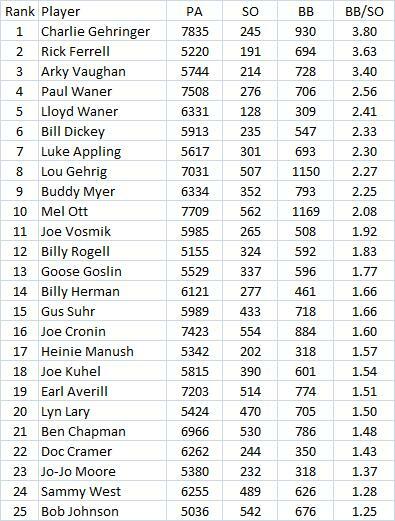 So instead of having Ruth take sole ownership of the RBI title (144-143), it should be Gehrig in the top spot by 147-145. And even if further research supports removing his RBI on 9-18, he would still own the title outright. One final note on Gehrig's RBI totals: if we adjust his 1928 figure from 142 to 147, that would also change his career mark from 1995 to an even 2000. But there is no reason to think that his totals from other years won't change as well. As a matter of fact, incomplete research from other seasons have him with one less RBI than officially credited in 1926, 1929 and 1938 (giving him an adjusted total of 1997), and I'd be very surprised if there weren't several more changes yet to come. For anyone tempted to read the original paper on which this story was based thinking that it might discuss Lou, you will be disappointed. Not only isn't Lou mentioned neither is baseball. The three cases for which the symptoms of Lou Gehrig's disease are attributed to head trauma include 2 pro football players and a boxer. It's also worth noting that the case histories of these three do not match Lou's at all. Two didn't develop the physical symptoms of their illness until they were in their mid-60's and the third when he was age 47 despite participating in sports associated with much more head trauma than baseball. It's also worth noting that two of the three developed marked cognitive impairment, i.e, inability to think, which preceded the onset of the physical problems and the third developed marked depression with outbursts of anger as the physical symptoms were appearing. As far, as I know none of this is anything close to what Lou experienced. All three of the cases in the original paper suffered from slurred speech within six months of the onset of their symptoms and two of them including the one who developed his symptoms at age 47 also had marked impairment in walking within that time period. There is no evidence of either of these when Lou gave his famous "Luckiest Man Speech" and as most people believe his symptoms certainly began before the six months preceding it, these are two more significant things that do not apply to him. 1. One of the cases is described as a pro football player who retired at age 36 but only played three years of pro ball. Has anyone ever heard of such a strange career? 2. The boxer is reported to have retired at age 22 after boxing professionally for 10 years which obviously means he would have had to start at age 12. Does anyone know of any boxers who began their pro careers at such a young age? Dr. King is a specialist in pain medicine in New York City. He also trained in neuropsychiatry early in his career at a major research center on the behavioral aspects of head trauma. How Well Did Roger Clemens Age? I also wrote a couple of articles called "Did Roger Clemens Have the Best Age-Adjusted Season Ever in 2005?" (parts 1 and 2) a couple of years ago. You can read them here and here. Again, the evidence was mixed and it is not clear anything unusual happened then. I used data from Baseball Reference and broke things down into the two leagues from 1901-2010. Balls in play (BIP) = BFP - HR - SO - BB - HBP. 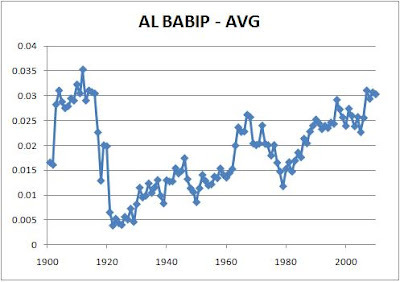 Here is the graph for the AL. Hits on BIP is H - HR. I don't know why it has changed over time and I am not even sure if it is important. But I was curious to see what it was. Now the NL, which has a similar pattern. The next graph shows the difference between BABIP and overall AVG for the AL, year-by-year. Again, I don't know if it is important or why it changes. So it looks like all the variables were significant. The r-squared was .287 and the standard error of the regression .0097. So it seems like when HR frequency rises, BABIP also rises. Maybe this means that balls are being hit harder, so they are harder to catch or it is just a general lack of good pitching. If SO rate rises, BABIP falls. If it is harder to make contact, it might be harder to make solid contanct. 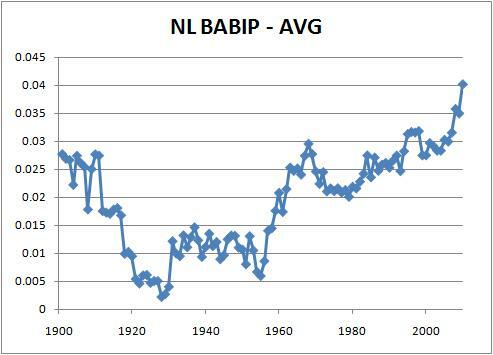 But if BB rate rises, BABIP again falls. Maybe it means that there are more pitches outside the strike zone, making it harder to get good wood on the ball. I wrote this a few years ago for the Chicago Sports Review. I thought I would post it again since Rob Neyer just had a blog entry titled White Sox by 'eras,' 1901-2010. Here is my original article. It corresponds to what Neyer calles the "The Joe Horlen Era." The Sox did not just have a good record, they also had a very good run differential. The Sox outscored their opponents by 469 runs, second only to the Twins’ 561. 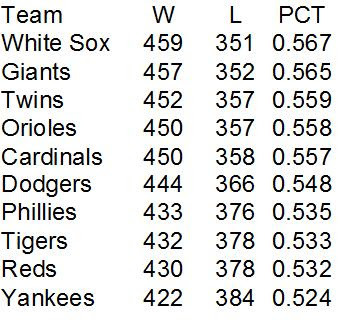 But if we use what Bill James calls the “Pythagorean winning percentage,” the Sox almost pull even with the Twins. You square runs scored then divide that by runs scored squared plus runs allowed squared. The Twins come out at .584 while the Sox come out at .582 (meaning the Sox may have been a bit unlucky). The Sox were only serious contenders in two of these five seasons. Although they finished in second in 1963 with 94 wins, they finished 10.5 games behind the Yankees. Their last day in first was June 14th and by Sept. 1, they were 12 games out. In 1965, the Sox finished 7 games behind the Twins, but their last day in first was June 28th and by Sept. 1 they were 7.5 games out. Then on the 15th they were 10 games out. In 1966, the Sox finished 4th, 15 games out. The two close calls were the disappointing, if not heart breaking, 1964 and 1967 seasons. In 1964, the Sox finished only 1 game behind the Yankees with 98 wins, a total which would have been enough to win the pennant in both 1966 and 1967. At the end of the day on August 20th, the Sox were in first place, a half a game ahead of the Orioles and 4.5 ahead of the Yankees after sweeping them four straight in Chicago. But the Sox played no more games against New York that year. So they could not stop the Yankee juggernaut which went 30-13 from then on. The Sox, although they won their last nine games of the season, only went 23-17 after this point Their last day in sole possession of first was Sept. 9th and they were eliminated on the next to last day of the season. 1967 might be even more disappointing. At the close of play on Sept. 26, the Sox were 89-68, one game behind the Twins who were 91-69. The Sox unfortunately went on to lose a double header to last place Kansas City by scores of 5-2 and 4-0. Then they got swept by 6th place Washington by scores of 1-0, 4-0, and 4-3. They were actually eliminated on Sept. 29th in that first loss to the Senators. Horlen and Peters are joined by ace reliever and knuckleball artist, Hall-of-Famer Hoyt Wilhelm. He saved 86 games while compiling a 1.95 ERA. Other standout pitchers include Juan Pizarro who went 16-8 in 1963 with a 2.39 ERA and 19-8 in 1964 with a 2.56 ERA. Tommy John won 38 games from 1965-67 with an ERA of 2.72. Reliever Eddie Fisher was 15-7 in 1965 with 24 saves and a 2.40 ERA, good enough for second in the league. 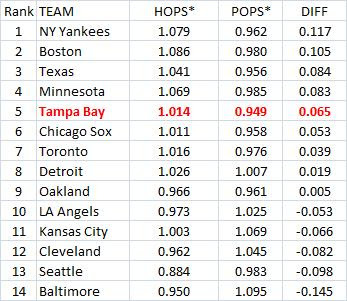 In four of the five years, the Sox led the AL in ERA adjusted for park differences, twice being 27% better than average. No other team reached 27% in the whole decade of the 1960s, not even the Koufax led Dodgers, who only topped 20% once (it was 26% better than average). Despite the great staff, no Sox pitcher won the Cy Young award. One reason is that only one award was given for both leagues up through 1966. With the great Koufax winning three of the four awards from 1963-66, it was tough for anyone else. The 1967 AL award probably should have gone to Horlen, who was 19-7 with a 2.08 ERA in 258 innings. But it went instead to Jim Lonborg of the pennant winning Red Sox who went 22-9 with a 3.16 ERA in 273 innings. Although Horlen pitched in a more favorable park, he still beat Lonborg in RSAA, 25-18. Bill James gives Horlen 23 Win Shares to Lonborg’s 19. Even with the stats in Horlen’s favor, in the mind of the voters, Lonborg’s being the one who made 20 wins, and for a pennant winner, must have been decisive. Horlen got two votes, Lonborg 18. The Sox had good fielders helped the pitching staff prevent runs. Center fielder Jim Landis, one of the few veterans left from the pennant winning team in 1959, won Gold Gloves in both 1963 and 1964 (second baseman Nellie Fox was there for just 1963 and Luis Aparicio had been traded after the 1962 season). Rookie of the Year Tommie Agee took one in 1966. Ken Berry, who played all the OF positions full-time from 1965-67, got one, but not until 1970. But there were other fine fielders. Shortstop Ron Hansen was the best fielder in both 1963 and 64, according the stat guru Bill James’ “Win Shares” method. Tommie Agee was the best twice, Ken Berry was second once and another outfielder, Mike Hershberger, was third once. The weak spot for the Sox was their hitting. 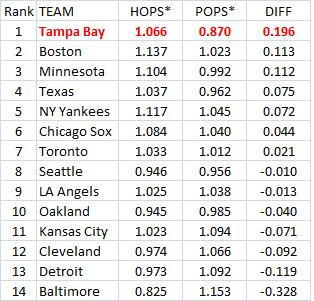 Over this period, their team OPS (on-base percentage + slugging percentage) was about 3% below average, after taking park effects into account. There were not too many good hitting seasons, but the best Sox hitters during this time were probably third baseman Pete Ward and outfielder Floyd Robinson. Ward hit .295 with 22 HRs in 1963 and hit .282 with 23 HRs in 1964. His career was hurt by injuries after that. 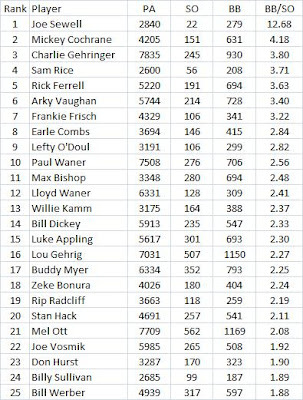 He did finish 9th in “offensive winning percentage” or OWP in 1964 with .666 (its another stat from Bill James). He just missed the top 10 in 1963. Robinson was the only Sox .300 hitter with .301 in 1964, when he was 8th in the AL with a .667 OWP. Don Buford was 10th in OWP in 1965 at .640 while batting .283 (actually very good for the 60s in Comiskey Park). Other notable hitting performances include Bill “Moose” Skowron who hit 18 HRs and batted .274 in 1965. 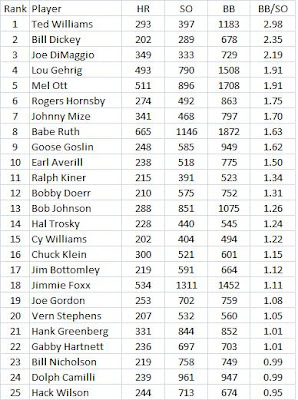 Hansen’s 20 HRs and .261 AVG in 1964 were pretty good for a SS. Agee batted .273 in 1966 with 22 HRs and 44 SBs. Catcher John Romano had fine seasons in 1965 and 1966, hitting 18 and 15 HRs. Although he only batted .242 and .231, his good on-base percentages of .355 and .344 pushed his OWP above .600 both years, which is great for a catcher. The Sox were third in SBs in MLB this period with 466. But they were thrown out 260 times, for 63% success rate, just barely above the average rate of 61.8%. So they were not exactly the “go-go” Sox.Buford stole 51 bases in 1966 for the best Sox total of the period. Agee’s 44 was second. It could be tempting to look at the weak offense as the reason for missing out on pennants in both 1964 and 1967, especially considering that the Sox once had good hitters like Norm Cash, Johnny Callison, Don Mincher and Earl Battey but traded them away. Cash had over a .600 OWP in both those years while hitting over 20 HRs. McCraw was .505 and .474. Callison went over .600 in 1964 with 30 HRs and 100 RBIs. After Robinson, that was much better than any other Sox outfielder. The Sox could be blamed for trading those young prospects for quality, but aging veterans after 1959 in hopes of getting back to back pennants. This may not be fair. Let’s see why. Cash was traded to the Indians and this brought Minnie Minoso back to the south side. None of the other players the Sox got in that one amounted to much or were traded for anyone who played key roles from 1963-67. But losing Cash hurt in the long run and there was no short term gain, as the Sox, of course, did not repeat in 1960. Callison was traded for Gene Freese, who had a solid year for the Sox in 1960. That was all he did. But he was later traded for Pizarro, who turned in some good years (Pizarro was later traded for Wilbur Wood, who turned in a solid year in 1967). Battey was traded for slugger Roy Sievers, who hit over 20 HRs and had over 90 RBIs for two seasons. He was later traded for Buzhardt, who pitched alot for the Sox but was just a journeyman. Mincher would have been a big help. A first baseman, his OWP in 1967 went over .700 playing almost full-time for the Angels. He hit 200 career HRs with a very solid .348 on-base percentage. On balance, these trades hurt. But one of the bad trades did lead to Pizarro and the Sox turned some good trades, too. The Sox got Agee, Romano, and Tommy John before the 1965 season for Landis and Hershberger, players who did not do much after that. Another big trade was when the Sox got Hansen, Wilhelm, Dave Nicholson and Ward from Baltimore for Aparicio and Al Smith in January, 1963. So we can’t blame trades since there some good ones and some bad ones. The following players received votes for the AL MVP award: 1963-Peters finished 8th in the voting and Ward 9th. 1964-Ward 6th, Peters 7th, Robinson 15th and Hansen 16th. 1965-Fisher, 4th. 1966-Agee, 8th. 1967-Horlen, 4th (ahead of Lonborg, who was 6th!! ), Peters, 8th, Hansen, 14th (who was also 17th another year). Sure looks like Hansen should be remembered as one of the top AL players of the mid-60s. To round things out, here are the players and pitchers who were on the Sox for all five years: Peters, Horlen, utility infielder Al Weis, Hansen, Ward, part-time catcher J.C. Martin, first baseman Tommy McCraw, infielder Don Buford, and pitcher John Buzhardt. Hansen was the starting SS for all but 1966 when he was hurt. Ward was the regular 3B man except for 1966 when he only played half the season. 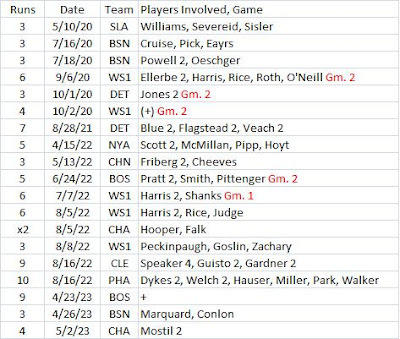 The following pitchers and players were there for four seasons: Robinson, pitchers Fisher and Buzhardt. Plus who could forget pinch hitting specialist Smoky Burgess, who did have 5ABs in 1964. These players were the core of a great team. My first post on the Astros was Astros Offense On Record Setting Low Pace. Right now their OPS is .665 and the league average is .729. So .665/.729 = .912, giving them a relative OPS of about 91. That would put them in the bottom 25 since 1993. The Astros have an OPS+ of 78 according to Baseball Reference. It takes park effects into effect as well as the league average (it is calculated a little differently than above). That is last in the NL this year. The Pirates are next lowest at 82. The lowest team OPS+ I found going all the way back to 1920 was 69 for the 1920 Philadelphia A's. The Blue Jays have an isolated power (ISO) of .210 since their SLG is .460 and their AVG is .250. That is higher than the all-time record of .205 by the 1997 Mariners. 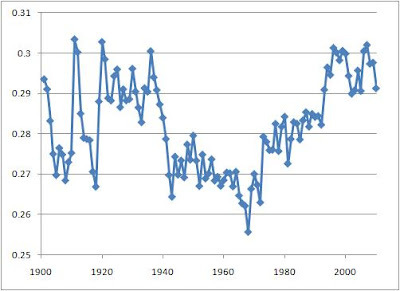 Relative to the league average, it would be the third highest since 1900, at 142 (.210/.148 = 1.42). The league ISO in the AL this year is .148. The 1927 Yankees are the highest in relative ISO at 153. My first post on this was Blue Jays On Record Power Pace. Is This An Era When Pitchers Don't Hit Enough Opposing Batters To Show Them Who's Boss? On the Tigers radio broadcast of the White Sox-Tigers game, the analyst, Jim Price I think, who was a Tigers catcher, said something like "the pitcher needs to make some of the White Sox hitters dance." The Sox were pounding the Tigers, leading 12-1 in the 8th. But then Price said something like "it is a different era, but in my day we would have been throwing at someone." -hitting a HR in the 1990s was 83% more dangerous than it was in the 1960s in terms of causing the player to be HBP. Since .0477/.0311 = 1.53, it means that hitting a HR from 2000-2009 was 53% more likely to get you hit by a pitch than in the 1960s. They have the second best record in baseball. But it looks like that is only because they are especially good in "clutch" situations. 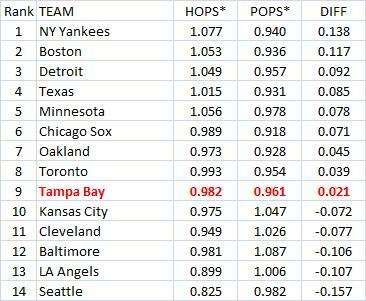 The table below shows the OBP & SLG by their hitters and the OBP & SLG allowed by be their pitchers. They have a solid edge over their opponents in OBP (.338 vs. .304). But they have almost no power edge, since they only out-slug their opponents .406-.402. Then they have a solid but not great edge in OBP with no runners on (.324-.304). The incredible thing is that they are out-slugged by their opponents with no runners on, .399-.414. But notice what happens with runners on. They have big edges in both OBP (.048) and SLG (.027). The edges only get alot bigger with runners in scoring position (RISP). Their OBP edge grows to .069 while their SLG edge is .072. They are no slouches in close and late situations, either. Their OBP edge is .080 and their SLG edge is .071. The Rays may have discovered the secret not only to clutch hitting, but clutch pitching as well. 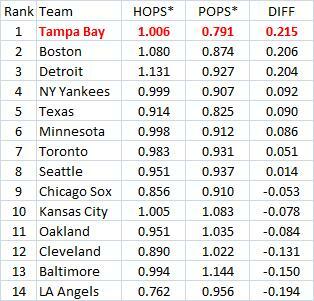 The next table shows where the Rays rank in the AL in the differential of what I will simply call OPS*. It is 1.8*OBP + SLG. Most analysts acknowledge that OBP is more important than SLG and a weight of 1.8 is often used. 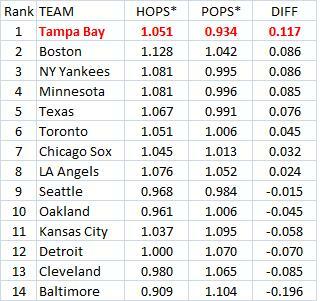 This table shows where the Rays rank in all situations. With no runners on, they rank fairly low. This does not look very impressive. But the next table shows the rankings with runners on base and they are well ahead of everyone else. They are equally impressive with RISP. They are also first in close and late situations.